Where am I? › Home > White Papers > Globoforce > Need to increase productivity without increasing headcount? How can HR leaders build a productive, engaged workforce for the long-term when employees feel dissatisfied, disengaged and unappreciated? Among respondents who stated they plan to search for a new job this year, only 24% are satisfied with the level of recognition they receive at work. Frequent, specific and timely recognition is a powerful means to communicate to employees that what they do is valued and appreciated. 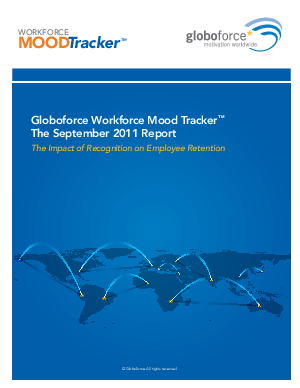 Download the Globoforce Workforce Mood Tracker September 2011 report to find out how your company can improve employee engagement and reduce turnover.